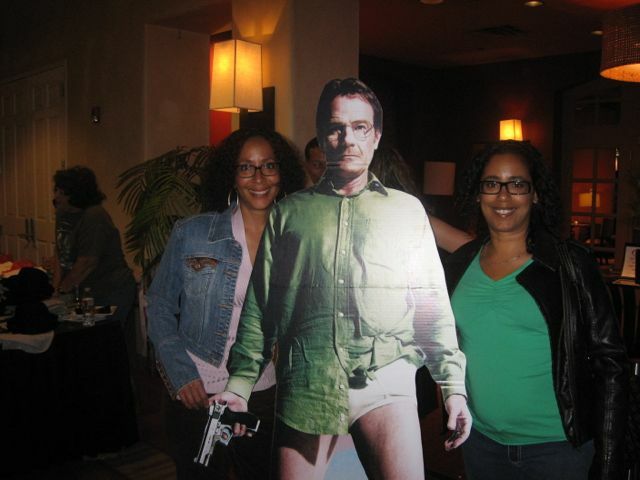 Text from me: Hey, Cyn, r u watching Breaking Bad? Want to go to the finale watch party on Sunday? Cynthia: Hey Shannon girl you know I’m watching Breaking Bad. Where’s the party??? 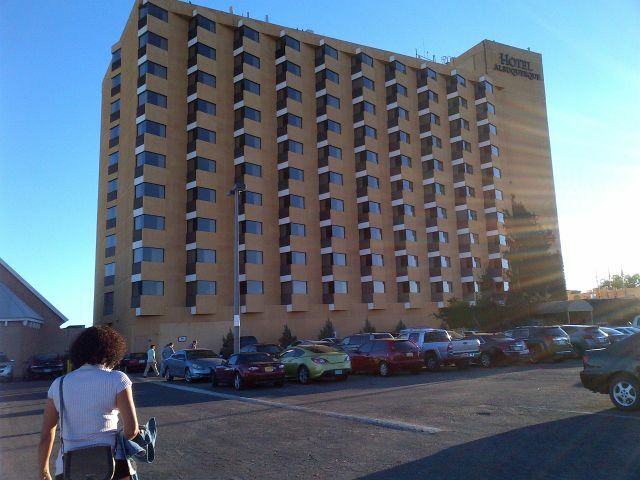 Walking from the street to the Hotel Albuquerque for the Breaking Bad finale watch party. 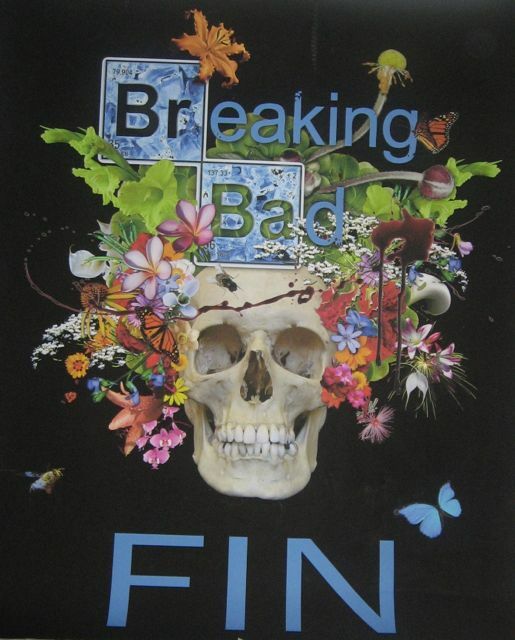 It’s also the end of Emmy Award-winning Breaking Bad, the show that made its home in Albuquerque, brought in $1 million in direct spending per episode (according to Mayor Richard Berry), and also made the Duke City a main character in the show. 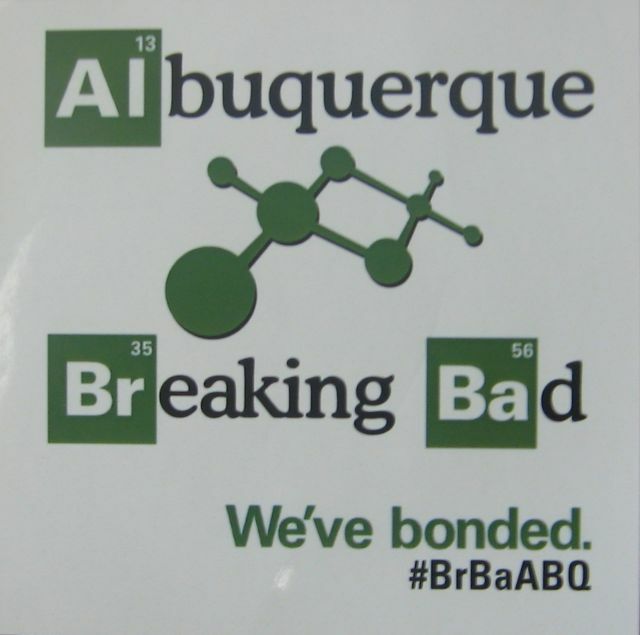 Sticker from the Breaking Bad finale watch party at the Hotel Albuquerque. 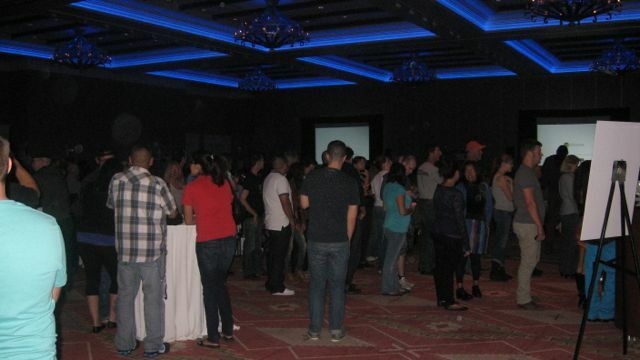 Inside the hotel, the ballroom was packed. 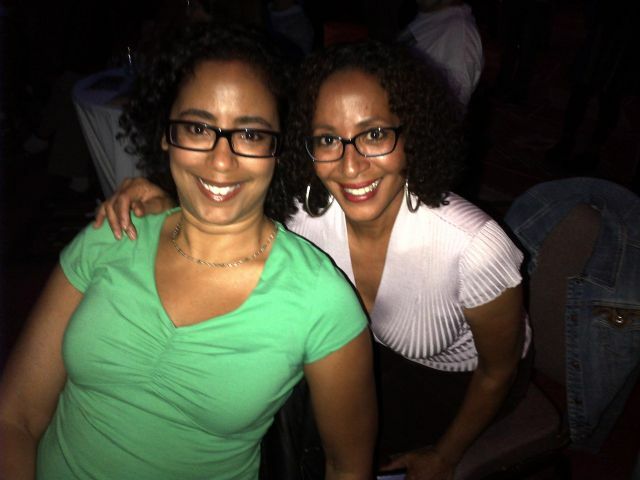 Cynthia approached a lone woman at a table and asked if all the chairs were taken. She said they were, that she was guarding the camera and video equipment for the rest of the gang, but if we could find some extra chairs we were welcome to share the table. Cynthia, otherwise known as my good luck charm, immediately scored two chairs from various locations, and we parked our behinds at the table. Turns out we were sitting at a “media” table: two of our table mates were reporting and filming for Gov TV and another writes for Steven Michael Quezada’s The After After Party. 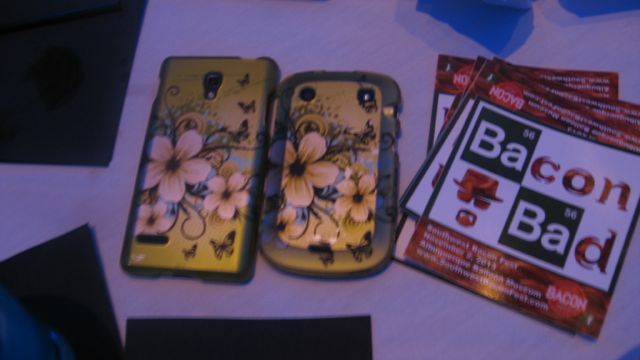 The woman who let us sit at her table had the same phone cover as me. How’s that for synchronicity? Some law of chemistry had to be at work here. 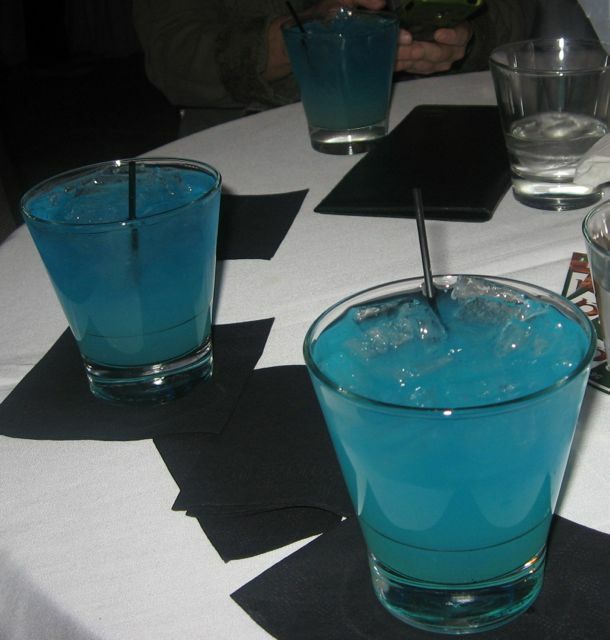 We bought our table hostess, and ourselves, some blue drinks. We were going to need liquor to get through the next 75 minutes. Breaking Bad has been such a huge part of our lives. Although we were both late to the game, Cynthia by one season and me by four, we were both instantly and irrevocably hooked on the show from the pilot. It’s like we’re losing a friend. Or several seriously messed up, yet beloved, friends. 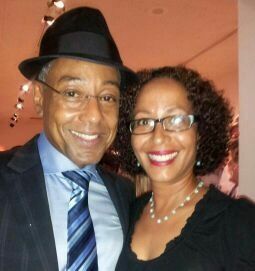 Cynthia with Giancarlo Esposito at the Albuquerque Film and Media Experience event in August. Throughout the finale, there was plenty of of whooping and hollering. But at the climactic scene that revealed, in all its glory, the fate of the Aryan Brotherhood, I’m pretty sure I was cheering the loudest. Hard to be too sad that the series is ending when the finale was so fantastic. Here’s the money shot right here. I was so disoriented and euphoric after the finale that on the drive home, I took the wrong exit. Twice. I blame Cynthia. She’d been reminiscing about how when she first moved here from L.A. she only took the city streets because she was so sick of driving on the freeway. So the drive home took a little longer than usual, through the back streets of Albuquerque. Fitting conclusion for the night. I’m pretty sure the after effects of arguably the best drama ever to air on television will last a lot longer. Corporate Executive Assistant by day. Writer by passion, necessity, and existence. Mom named me after Shane. The book. Explains a lot.